Ricardo Santos was pretty happy with his late winning goal at Doncaster. Photo: Joe Dent/theposh.com. Jon Taylor celebrates his rapid hat-trick against Blackpool. 1-1 (home) v West Brom in the FA Cup. Posh deserved to beat their Premier League opponents in a fourth round replay in February, but lost on penalties. It was the last time they played well under Graham Westley. From the sublime to the ridiculous in the space of four days. For once Westley didn’t make enough changes and a knackered line-up were hammered by a team who scored very few goals. Luke McGee has been a brilliant Posh signing. Beating Fergie’s Doncaster away from home in March pleased a lot of travelling fans, but surely the 111 Posh fans who turned up at Barnet for an irrelevant Checkatrade Trophy tie in November deserve all the plaudits. Or they need certifying, one or the other. Goalkeeper Ben Alnwick played Coventry on his own in the first-half of the Good Friday game, Martin Samuelsen and Chris Forrester were both brilliant against West Brom, but Jon Taylor’s 12-minute hat-trick as a substitute against Blackpool takes some beating. Marcus Maddison has been the best Posh player in 2016. Marcus Maddison. A consistent 12 months from a gifted player who for some reason divides opinion among Posh fans like Brexit and Marmite. He’s good, so is Brexit, but Marmite is bad. A special mention also to the consistently excellent Michael Bostwick. Darragh MacAnthony’s removal of Westley in April, a manager who thought the phrase ‘5-a-day’ meant compulsory team changes. Graham Westley’s decision-making in the January transfer window and his player-selections from February onwards were all bizarre. Bringing a frail-looking Jordan Nicholson on at half-time against the hardmen of Millwall at the new Den was scarily stupid. Luke McGee. The best Posh goalkeeper since Ian Bennett who signed for Posh 24 years ago. Gwion Edwards excites me. 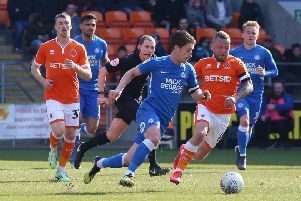 He’s a midfield version of Craig Mackail-Smith, hard-working, quick and scores goals. The 3-2 win at Sheffield United in the first game of 2016 had it all. Three great Posh goals, an amazing winner from Martin Samuelsen and a bonkers own goal from Jack Baldwin. I watched Leo Da Silva at Bury last season and thought he was useless and clueless. He’s actually pretty good, especially when the TV cameras are around. Souleymane Coulibaly improved as soon as he left Posh! If it’s an 21 and under award, it has to be McGee. If it’s an 18 and under award it can only be Da Silva Lopes, even if he drives me potty sometimes. The one and only Darragh MacAnthony (@Dmac102) is miles ahead of the rest. I do wish he’d take a deep breath before tweeting sometimes, but his inter-action with fans is looked on jealously by followers of other clubs. An honourable mention to celebrity Posh fan Adrian Durham (@talksportdrive), when he isn’t bickering with the chairman. Anyone who acts big by trolling Marcus Maddison. They didn’t tweet him after Northampton away. I won’t dignify them by plugging their accounts on here. 1) Appointing Grant McCann as manager. 3) Beating Cobblers away 1-0 with a last minute goal. 4) The celebrations of Ricardo Santos after a late winning goal at Doncaster. 5) Getting £100k for Ricardo Santos. 1) The baffling methods employed to sell the Chelsea FA Cup tickets. 3) Dropping so many home points.